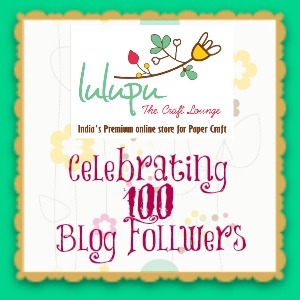 Lulupu - The Craft Lounge: Lulupu.com celebrates 100 Blog Followers! It has just occurred to us that we have already crossed 100 followers on our Blog!! We have met some wonderful people in blogland and we are thrilled that so many of you have decided to follow Lulupu and shower us with your love! It has been a wonderful journey to see your enthusiasm in participating in our monthly challenges and leaving some kinds words as comments for our DT and the tutorials shared. To celebrate and say thank you for all your support and kind comments Lulupu.com would like to offer a little candy. We would be glad if you could spread the word to your friends and help us get more followers who enjoy crafting as much as we do! You have 2 weeks to to participate in the Lulupu 100 Blog Followers Giveaway. One lucky winner will receive a Gift Voucher worth INR 1,000/- with Free Shipping from Lulupu.com !! We will randomly select a winner on Monday 5th November 2012. We invite International participation as well and would be happy to ship the candy worldwide. Follow the simple steps and get a chance to participate 3 times and increase your chances to win! Be a Follower of our Blog, if you are not already and post this Badge on your Blog's side bar with a link back to this post! Link details are available at in the box under the badge at the end of the post. Once completed add your name to Mr.Linky for first time along with your Blog's link. This is the primary requirement to participate. We thank you all once again for your love!! LULUPU IS AWESOME...HAPPY SEEING IT FLOURSHING ,BEST WISHES.DONE ALL CRIETERIA.THANKS FOR CHANCE. Congratulations a lot for achieving 100 Followers & wish u more & more...Thanks for the lovely giveaway...! !Done all the three's..!! done everything you have asked to except twitter ..
Hi Karuna, Thanks for ur comments on my blog. I have posted badge already and backlinked correctly too. Shared in FB and added my blog in Linky also. From ur comment, couldnt get it clearly. Congratulations !Thanks for the candy I have added the HTML code on my blog's sidebar. Hi Karuna, Thanks for ur comments on my blog. Ok i made the corrections as suggested by u..i thought that the code below the inage is for the badge so i picked it up & add it to HTML tagging but it was not linking back to ur blog..but now removed it & correct the link back badge...!! Thanks for the prior information other than i ll miss the chance to win..!! Now its linking back to blog :)have shared it on FB too. Hi Karuna ! Edited the HTML code so that it links back to this page .I have checked it. I love your blog as well as the variety of products that you have in your store. Done all the stepps except the twitter one, as I don't have a twitter acc. will soon post this on my pages too. Wishing u tonns and tons of more followers and good luck!!! congrats karuna and the gals :) good going ! Wish you lots of luck for the future ! Congrats lulupu team..My best wishes for more and more followers. Karuna, Congratulations on your 100 Followers... And u deserve more. Thank u for guiding me into the giveaway by leaving a msg in m blog. Done all needful. Thank u for the chance. Many Congratulations on reaching 100+ followers. It is 113 now :) and good luck for the next milestone. And thank you for the chance for winning. Congratulations Karuna for this milestone n wish you many more to come. Congrats and thanks for a chance to participate.. Good luck! 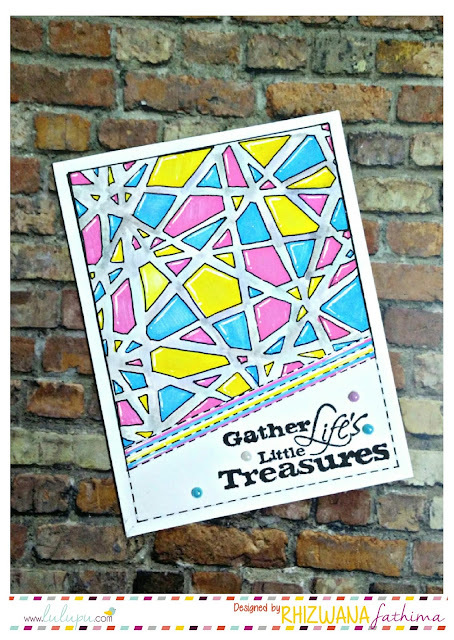 Congratulations Team Lulupu....almost all of my inspiration to try out handmade cards began from watching you guys on youtube :-) And my first set of crafting stuff also came from you guys...thanks a lot for all the inspiration....keep the great work going.